Last Wednesday marked the 100th anniversary of the Halifax Explosion, which plays central to The Tides of Honour. Having never visited the East coast I know very little of its history and what I do gleam is from my reading, which made me excited to read this one. 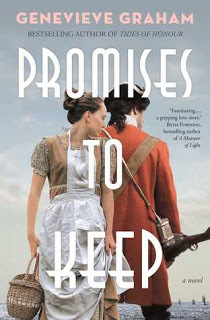 I am relatively new to the writings of Genevieve Graham, Promises to Keep opened my eyes to the Acadians and their plight. It also showed me how little I know of this great country's history. 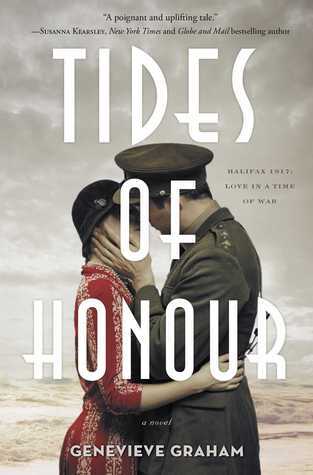 With Tides of Honour the trauma of World War I is not just felt in Europe but reaches to Canadian soil as well. It takes its toll on Private Daniel Baker as he arrives back in Canada with deep physical and mental wounds. As he is adjusting to his new life at home his young bride arrives, though overjoyed it also causes more anxiety. Now add the explosion and there is a lot to take in, but it works. It works because it’s real, the war is still going strong in 1917 with Canadians playing a part. The characters are authentic, they are flawed, they hurt, they grieve and lash out at those they love. Life isn’t what it used to be nor will it be the same again. It isn’t often that I come across a story told with a male POV and it was a refreshing change. There are parts that alternate with Audrey (his bride) but for the majority of the time it was Danny and getting inside his head with its wide range of emotional conflicts. Tides of Honour is a realistic look at the struggles of war, losing friends, PTSD and new beginnings. It’s an emotional story, drawing on the heartstrings of not just this family but those affected by the explosion, there is a real sense of the devastation that transpired. 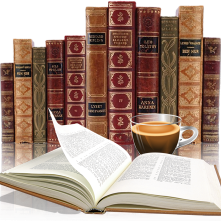 Genevieve Graham is a Canadian author who has a love of Canadian history and it shows in her writing. The amount of research is evident as well as her passion to share this part of our history. Be sure to check out the her website for a look at her other books. Though I have a print copy in my personal library I opted for the audio version (via audible). It was great in this format with the reader doing a stellar job.